In recent decades there has been a rise in the number of people claiming to speak in tongues. Are these claims legitimate and does the Bible teach that Christians should be speaking in tongues today? 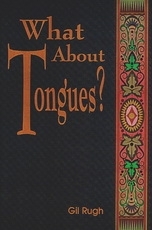 In his booklet, "What About Tongues," Pastor Gil Rugh looks at these issues and helps answer the following questions: What is biblical tongues? What was the purpose of tongues in the Bible? Are Christians to seek speaking in tongues today? What is really happening with the modern tongues movement? Pastor Rugh will help you see what the Bible has to say about this controversial and often misunderstood issue.